We're glad you are here! 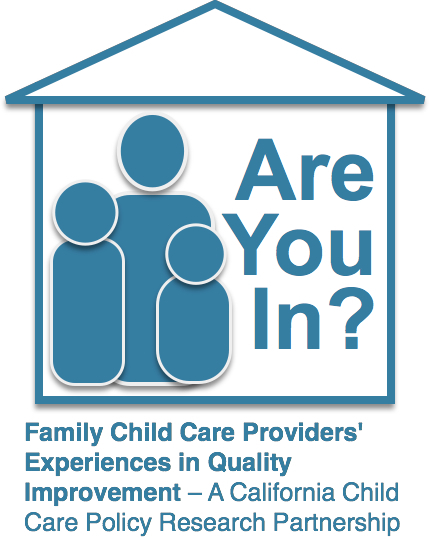 This site provides information about an exciting research project in California studying daily life in family child care homes. Check it out, explore, and get involved or help us spread the word! Have a story about family child care to share? Want to find out more about this research? Please click below to contact us! We'd love to hear from you. This project is supported by the Child Care Research Partnership Grant Program, Grant Number 90YE0153, from the Office of Planning, Research and Evaluation, Administration for Children and Families, U.S. Department of Health and Human Services. The contents of this web site are solely the responsibility of the authors and do not necessarily represent the official views of the Office of Planning, Research and Evaluation, the Administration for Children and Families, or the U.S. Department of Health and Human Services.